Three Boy Circus: Scream For Ice Cream! Cold Stone Creamery is currently offering Shake Up Happy Hour. Monday through Friday from opening until 5pm, you can get a Like It (5oz) for $3 or a Love It (8oz) for $4. They have several flavors to choose from: Milk & Oreos, Cake Batter, Oh Fudge, Cream de Menthe, Very Vanilla, and Savory Strawberry. This promotion has been going on for at least a month and according to their Facebook page, it's still going on. It is a limited time only, but it's unclear when exactly it will end. So go now! If you have a Ben & Jerry's scoop shop near you, consider yourself lucky! In my opinion, this is the best ice cream ever! Fortunately, pretty much every grocery store carries the pints for our satisfaction. My personal fave is Phish Food. TRY IT! The scoop shops offer shakes, smoothies, cakes and of course, ice cream sundaes. 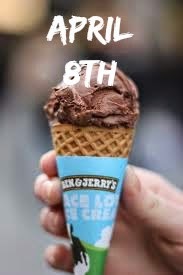 April 8th, Ben & Jerry's will be having Free Cone Day at their scoop shops from 12-8pm! Check here for locations close to you. 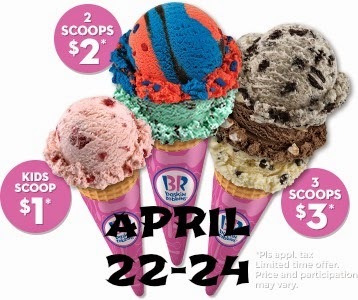 And lastly, Baskin-Robbins will be having Scoop Fest April 22-24. During this special promotion, they will have kids scoops for $1, double scoops for $2, and triple scoops for $3! I would call your nearest location to see if they are participating though. In the past, I've had coupons from Baskin-Robbins and some locations didn't have the specified flavor or they would not honor it. All the ice cream promotions do smack of National Ice Cream Day. Just another sign that warmer weather is upon on us. Goodness, I hope so! The sun has been making an appearance every now and then, but it's still been cold here.